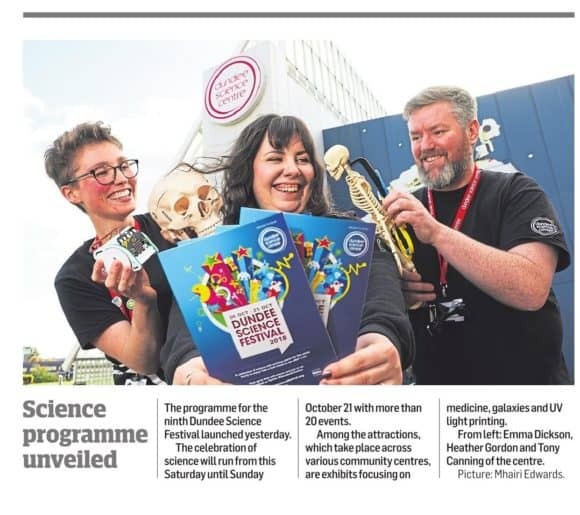 The programme for Dundee Science Festival was officially launched today (Tuesday 2 October 2018). Now in its ninth year, the celebration of science will run from Saturday 6 October through to Sunday 21 October 2018, with over 20 events designed to entertain, inspire and fascinate, most of which are free of charge. As the final countdown begins, the festival was officially launched today, with the team illustrating the themes of the three special weekend events with medical innovations, solar telescope and virtual reality headsets. Throughout Dundee Science Festival, the emphasis will be on exciting and accessible events, with the majority taking place within community centres and Dundee Science Centre. With families at the heart of the festival, free ‘Science Adventure’ and ‘Storytime Session’ events will take place in six community centres, while ‘Big Bang! The Rocket Man Show’ and ‘Danger! High Voltage! will, quite literally, inject sparks, bangs and electricity into the festival! There is plenty on offer for adults too, with free creative workshops challenging visitors to transform old jewellery into stunning new pieces or experiment with UV light printing. 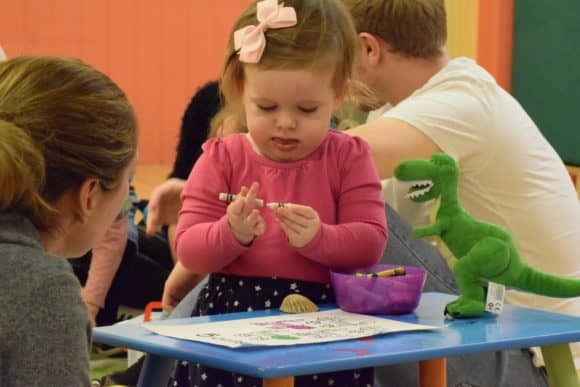 Family-focused events will also run at Dundee Science Centre over the three weekends of the festival, all taking place from 10am until 5pm (standard entry fees apply). The first, ‘Marvellous Medicine’, will take place on Saturday 6 and Sunday 7 October – come along and try your hand at keyhole surgery and see inside the human body. Visitors can also take part in fantastic activities delivered by a variety of experts working at the cutting edge of science, while enjoying everything that Dundee Science Centre’s brand new exhibition ‘Medical Marvels’ has to offer. Meanwhile, on Saturday 13 and Sunday 14 October, head on a ‘Voyage into the Unknown’ and immerse yourself in the science that is around, beneath, inside and above us, from the smallest of insects to the most distant of galaxies. Finally, as Scotland’s healthcare system becomes increasingly digital, the final weekend will focus on cutting-edge technology, with the chance to explore ‘My Digital World.’ Come and explore the gadgets and innovations which are transforming our health, wellbeing and safety on Saturday 20 and Sunday 21 October. Dundee Science Festival is brought to you by Dundee Science Centre, Scottish Government and University of Dundee. For more information, and to view the programme in full, please visit www.dundeesciencefestival.org or follow Dundee Science Festival on social media – @DundeeSciFest (Twitter) https://www.facebook.com/DundeeSciCentre/ (Facebook).